The decoration on this vase is exceptional. A beautifully done bird with flowering vines and little flowers along with two huge Chrysanthemums fill the front of the vase. On the reverse, the decoration is sparser, yet effective in its simplicity. 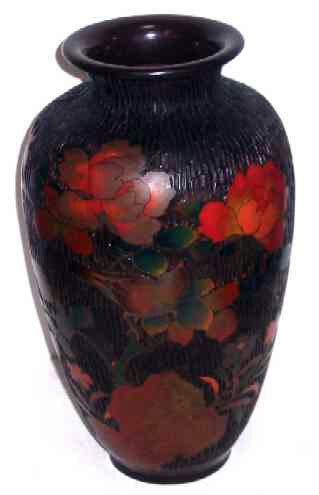 This heroic size is very unusual for this technique which was generally limited to small vases. It stands an impressive 11-1/4" tall giving the flowers and bird a realistic scale . . . The only large one I've seen in reality or in books. There is some very minor flaking under the rolled rim that one has to look very hard to see and mentioned merely for the sake of accuracy. A rare example for the collector or appreciator of the art of the Orient and the prize of any serious collection.